One feline-loving California resident recently hired Trillium Enterprises to give his house a $35,000 cat-friendly makeover. 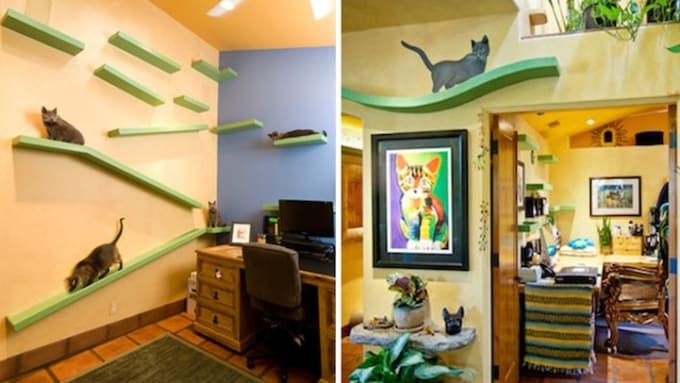 The finished product features brightly colored catwalks, tiny staircases, scratching posts, and tunnels. The man also wisely installed a turbo-charged ventilation system to help ward off the inevitable scent carnival that accompanies owning 18 cats. This is surely a unique way to approach interior design, but it&apos;s unclear if the homeowner should be lauded for his devotion to his animals questioned about his fiscal responsibility (and design decisions).